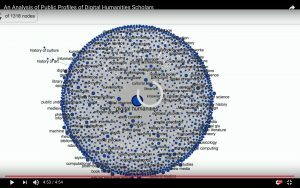 Research subjects of the current study are the users of Google Scholar Profile who are displaying the lable “digital humanities” in their public profiles. Google Scholar Profile is a free bibliographic service. It allows scholars to display affiliations, labels, and homepages, to list their publications, to keep track of who is citing their publications, and to follow research themes. On the profile page, labels are areas of interest filled by the scholar herself/himself. Therefore, labels are explicit digital representation of a scholar’s academic identity. Labels are clickable on the profile page. By clicking on one label, take “Digital Humanities” for example, you will be directed to a new page, where Google Scholar users who put the label “Digital Humanities” in their profiles are listed. In total, there are 751 Google Scholar users in the list. Another way to get the list is to visit the following url with advanced search operators “https://scholar.google.com/citations?view_op=search_authors&hl=en&mauthors=label:digital_humanities”. R programming and the package “Scholar” were used to harvest the Google Scholar profiles pages of the 751 users. After deleting duplicate profiles (i.e., the same person uses two Google accounts to create two Google Scholar profile pages), 747 scholars were identified as the research subjects of the current study. For each scholar, I collected his/her name, user ID assigned by Google, labels, affiliations, citation indices including total citations, h-index and i10-index. 1,318 labels were collected and a network of the 1,318 labels was created. In the network, nodes are the 1,318 labels, and edges are defined as if two labels appear in the same profile, there is an edge between the two labels. According to the above define of edges, 3,925 edges were established. I use Google Fusion Tables to visualize the network. We can see that major themes in the field of digital humanities, from the most visible labels to the least visible labels, include library and information science, history, natural language processing, machine learning, literature, media studies, computational linguistics, cultural heritage, artificial intelligence, and so on.